Trapdoor spiders need to get out-of-doors more – Several groups of sedentary homebodies on Catalina Island need to get out from under their rocks to make connections. 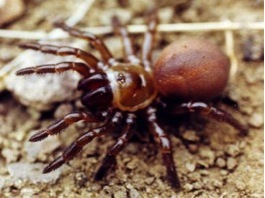 Known to science as Bothriocyrtum californicum, the big, pudgy, subterranean trapdoor spiders could use some genetic variability for future sustainability of their groups – around Avalon, at Toyon Bay, the Airport in the Sky and Little Harbor. At this point, Catalina’s trapdoor spiders aren’t in any danger. But the spiders aren’t helping their cause. Babies usually stay in the same area as the mother spider, dig their own homes nearby and mate locally. Staying close to home limits their genetic diversity and adaptability. A typical trapdoor spider burrow is eight to 10 inches deep with enough room for the inhabitant to turn around and has a tight-fitting rock on top. A trapdoor spider detects the motion of close-crawling bugs and quickly tosses back the “door” to pounce on its meal. It drags dinner into the burrow and replaces the rock. They feed on bugs seized outside their burrows and grow to the size of a computer mouse. A female spider can grow to be two inches in length and up to an ounce in weight. Trapdoor spiders can live up to 20 years – a phenomenal age for an invertebrate. But they will spend their lives mostly on one hillside. Catalina’s historic situation has not been the best for the underground spiders. Ramirez says that intermittent fire suppression on the Island, as well as big mammals, such as non-native livestock prior to removal, may have collapsed many of the spiders’ burrows and cut off populations from one another. Wasps are the trapdoor spiders’ only known enemy on Catalina. Some species of wasps tear the rocks off spider burrows, then sting and paralyze the inhabitants to insert larvae into the victims. The immobile yet living spiders then serve as hosts to feed the young wasps. In Central and South America, bird-sized wasps called colossal tarantula hawks, paralyze big spiders in the same manner. “Wasps are out on the Island,” Ramirez said. “I’ve run into instances of parasite impact. The wasp cocoon is like a cigar sitting in the burrow.” Inside the cocoon is the drained husk of a dead spider. Fact or Fiction: Black/Yellow Argiope - nocturnal? Trapdoor spiders fatten up on bugs, which they surprise by darting from under their manhole-like little rock covers. Copyright © 2019 Catalina Island Conservancy. All rights reserved.